Passed CA/ CFA/ MBA/ PGDBM in Finance stream with minimum 60% Marks and 2 Year Post Qualification Experience in Similar Field. 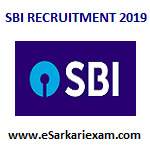 Eligible Candidates can Submit SBI Specialist Officer 2019 Online Application at the Official Website of State Bank Latest by 25th April 2019. Applicants First Open SBI Official Website. Click on Specialist Cadre Officer on Contract Basis Recruitment Advertisement Link.